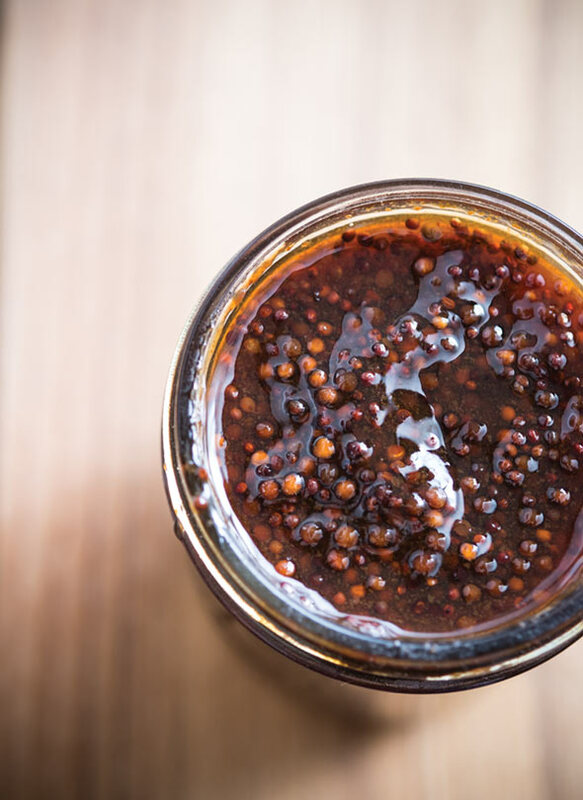 This spicy apple cider-mustard glaze is made with mustard seeds, honey, cider vinegar, and cayenne pepper and goes with just about everything. So simple. So superb. So you have a pot of sticky, luscious apple cider glaze before you. Now what to do (other than swipe a fingerful now and again)? That’s easy. 1. Dump the apple cider, honey, mustard seeds, vinegar, Aleppo pepper, if using, and cayenne in a large, wide pot and bring to a boil. Reduce the heat and gently cook at a low bubble, stirring only occasionally, for 2 1/2 to 3 hours, until it’s reduced to almost 1 1/2 cups (360 milliliters). Skim any froth or foam appears on the surface. 2. 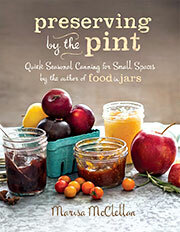 When the glaze is nearly reduced to 1 1/2 cups, prepare a boiling water bath and 3 half-pint (250-milliliter) jars. Place 3 lids in a small saucepan of water and bring to a gentle simmer. 3. When the glaze has reduced, remove the pot from the heat and funnel the warm glaze into the prepared jars, leaving 1/2 inch (12 millimeters) space at the top of each jar. Wipe the rims and apply the lids and rings. If you want to properly can the glaze so you can keep it at room temperature for months and months, process the jars in a boiling water bath for 10 minutes or according to the manufacturer’s instructions. The glaze will keep, unopened, at room temperature for up to several months. Once opened, the glaze will keep in the fridge for up to several weeks. If you’d rather not bother with canning and just want to be done already, simply stash the jars in the fridge and use within a few weeks. 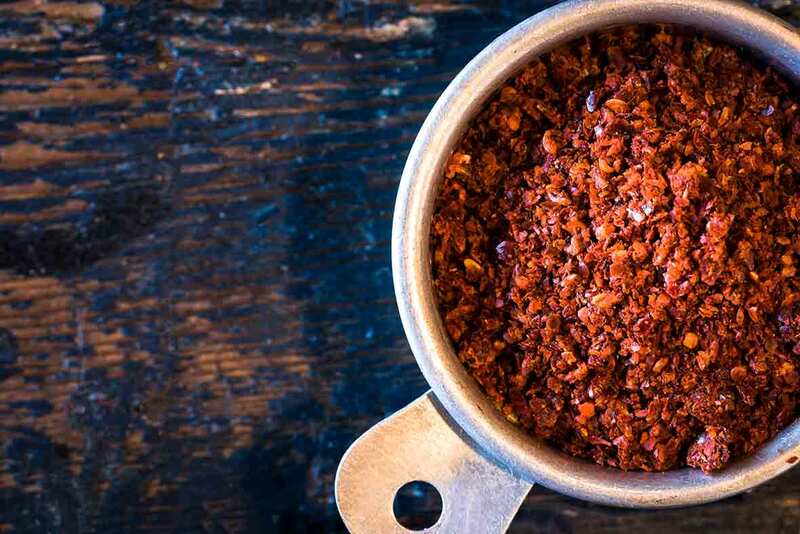 Aleppo pepper, named for the ancient city of Aleppo along the Spice Route, is commonplace in Middle Eastern and Mediterranean cuisines (as well as the markedly well-stocked pantries of those who frequently travel there). Yet it’s not so well-known stateside. Aleppo has something of a mild, sweet heat, somewhat similar to that of an ancho, although truthfully, there’s no adequate substitute for it. You can opt instead for a heat of a vastly different sort, whether it be your favorite crushed peppercorns, a pinch of crushed red pepper flakes, or a combination of precisely 4 pinches sweet paprika to a single pinch cayenne. Whatever a little heat means to you, use that. And then let us know how it goes. I loved this spicy apple cider-mustard glaze. It required a bit of time and more vigilance than I anticipated, but it’s ever so worth it. The first batch went from bubbling nicely and reducing gently to a full goopy caramel—with an underlying taste of piquant burn—but even that mess was fantastic. I kept an eagle eye on the second batch, which was perfect. Thick and flavorful. It was so layered that even on chicken, you could identify each of the ingredients at different moments in each bite. I'm a voracious canner, so I loved the ability to put this up and immediately made enough to put in small half-jars to gift as presents. Such a unique gift. I served mine over a lovely pork loin and a crisp potato cake. Delicious. This spicy apple cider-mustard glaze is terrific and very versatile. It boils down to a syrup-like consistency that clings well to whatever you put it on. The mustard seeds soften during the long cooking yet still pop in your mouth—a delightful texture. My first use for it was as a glaze for grilled chicken. I brushed some on after the chicken went on the grill and then brushed some more on a little later in the cooking. I also used some as a salad dressing over mixed greens and roast sweet potatoes. That worked great as well. It would be ideal with pork chops and would make a terrific glaze for a ham. I did double the amount of cayenne to 1/4 teaspoon, which gave it a very gentle warmth—not hot by any means. I could see increasing the cayenne even more if you want it spicy. While I made this on the stovetop as directed, I imagine it could also be made in a slow cooker on high with the lid off. This spicy apple cider-mustard glaze is a great way to preserve the flavors and smells of fall. We brushed the glaze on grilled pork chops but only the last minute before we took them off the grill. The glaze was sticky and fragrant, and I'll be brushing it on chicken next time! We loved the bite of the Aleppo pepper and mustard seeds. I used a mix of yellow and brown mustard seeds. I cooked the mixture down for 2 1/2 hours, but next time I think I'll stop it before it gets so sticky in the pot, so maybe 10 minutes less. The processing instructions were well explained, but if you have refrigerator space, that would be easier. It should keep very well in the refrigerator for a month and even longer in the freezer. I was looking for something quick and easy to jazz up some leftover grilled chicken thighs I was dreading having to eat. This sauce totally saved them. Since I am a mustard fiend, this was right up my alley. With the cider, it was the perfect fall condiment. Took just a little time to whip up. I can see this being good on ham, pork chops, maybe even spicy brats. A real winner—and a savior of a sauce for leftover meat. I really like that this spicy apple cider-mustard glaze is meant to produce a pretty large amount of glaze so that the rest can be canned. I think this is a versatile recipe that’s great for fall. I used the glaze for a pan-roasted pork tenderloin, but it would be great on bone-in pork chops, chicken, even on roasted veggies (I'm thinking broccoli or Brussels sprouts). I really didn't get as much of the mustard flavor as I had hoped. Maybe I needed to simmer everything at a lower temperature for a longer amount of time to really get the flavor from the mustard seeds. I gave this at least 3 hours to reduce enough in volume to be glaze-worthy. I didn’t have Aleppo pepper, so I used a dash of cayenne and about 1/2 teaspoon Korean chile flakes to see how that worked. (I was hoping to impart some fruity heat.) In the end, the spice level was pretty low, so next time I would kick up the cayenne or source some Aleppo. I might even add prepared whole-grain or Dijon mustard next time. Spicy Apple Cider-Mustard Glaze Recipe © 2014 Marisa McClellan. Photo © 2014 Steve Legato. All rights reserved. All recipes and photos used with permission of the publisher.